For a very long time Irkutsk was a center of art culture of Siberia. It was famous for collections of art works. In the 1870s on the territory of Siberia a popular picture gallery of V.P.Sukachev appeared. In the Soviet power years it became a basis of the largest art museum. On the turn of our century in Irkutsk the first art school was created. It was founded by N.I.Verkhoturov in 1900, but it existed not for a long time, only for a year because there were no funds for its maintenance. A.F.Lutnev, a pupil of the Moscow school of painting, sculpture and architecture opened art school in 1906. It worked for ten years and stopped its existence in the years of the Imperial war. 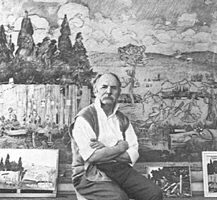 I.L.Kopulov just having finished the Parisian studio of Zhulien, organized an art studio – workshop in 1910, which was the basis for art school foundation in Irkutsk. In 1900 there were visiting exhibitions in Irkutsk. 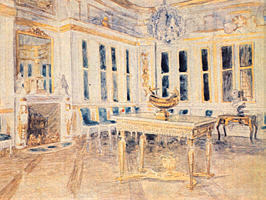 In 1903 there were two of them: the first All-Siberian and exhibition of the French painting which arrived from Paris. Since 1908 at the museum of the Eastern-Siberian department of Russian geographical society the art exhibitions were organized annually. Not only Irkutsk artists participated there, there were art works from other cities of Siberia. Besides professionals, the works of the amateur artists and applied art were exhibited. In the following years outstanding metropolitan artists such as Repin, V.Polenov, V.Serov, K.Somov, M.Dobuzinskii, L.Baxt, V.Borisov-Musatov, L.Pasternak sent their works in Irkutsk. A significant group of painters in Irkutsk caused the foundation of the Irkutsk society of the artists in 1910, but it was possible to issue the charter and officially to register association only in 1915. 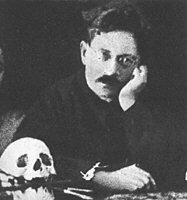 The society was self-liquidated in 1923, after that a lifelong dream of the local artists was a foundation of a new creative forces association of Siberia. 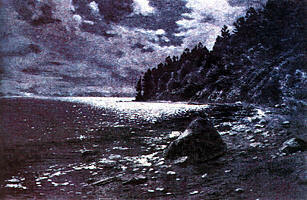 In 1925 the initiative was undertaken by an Irkutsk painter and diagram B.I.Lebedinskii. He decided to organize an exhibition of Siberian artists in Irkutsk and on its basis to organize a united creative organization of Siberia. But only in May 1932 in Irkutsk, being the capital of the Eastern-Siberian territory in that time, the city union of the artists and organizational bureau of organization of artist unions of all region were established. After formation of the Irkutsk region the creative association began to be called as the Irkutsk regional union of the Soviet artists. During the Great Patriotic war the work of Irkutsk creative collective did not stop. At this time several exhibitions were arranged: the antifascist poster and caricature (cartoon); an exhibition, devoted to the 25th anniversary of the Great October Socialist revolution; an exhibition devoted to 25th anniversary of the Red Army; interregional exhibition of Siberian and Far Eastern artists. In September 1941 in Irkutsk the regular release of the posters agitation windows of TASS was organized. 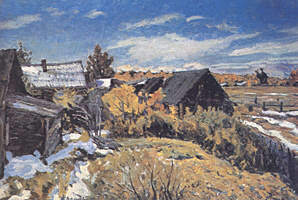 After the war the Irkutsk organization of the artists increased and got stronger creatively, though almost all evacuated artists during the war came back to native places. A.P.Zhibinov, A.Sh.Zakirov, E.A.Konev, V.S.Rogal, A.K.Rudenko, I.E.Ushkov returned after the war to Irkutsk. New persons entered the union. After a long absence B.I.Lebedinskii arrived here, V.F.Olkhovik and A.P.Krulov settled in Irkutsk. 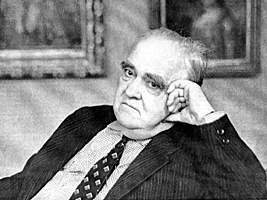 The basic, active nucleus of the members of union, working here under difficult conditions of military rear was kept: V.P.Tomilovskii, S.K.Gvozdev, N.V.Shabalin, S.M.Razvozaev, V.I.Bogdanov. 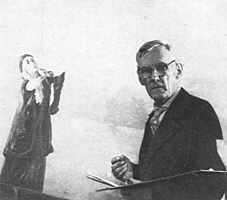 The Estonian painter A.R.Madisson working during the war here and a painter, display arranger V.N.Lebedev, having arrived in Irkutsk on the eve of military events, remained here. The artists of Irkutsk regularly accepted and took part in republican exhibitions in Moscow, interregional, zone and regional exhibitions. Many works cause a great interest and receive a high estimation. Time goes on. The events run and vary. In creativity of the artists there are new themes suggested by life and new products are being created. Irkutsk organization of the Artists Union of Russian Federation is 70 years old. During its existence the association united creative forces, organized exhibitions and contributed to the development of art culture of Siberia. 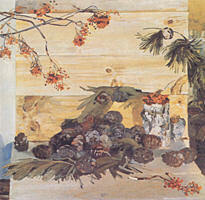 People are familiar with works of the local masters not only in Russia, but also abroad. The exhibitions of the Irkutsk artists visited Mongolia, China, Germany, Cuba, Hungary, Japan, the largest countries of Europe and Asia, Africa and American continent. Today the collective of Irkutsk artists consists of more than a hundred members of the creative union. Here there are painters, diagrams, monumentalists, artists of theater-decorative and decorative - applied art, representatives of different age and generations. Among them there are recognized masters of fine arts; many of them have honorable governmental ranks and awards. The creative collective of Irkutsk artists is considered to be one of strongest organizations of Union of the artists of Russia. The information about Irkutsk art culture is taken from introductory article by A.D.Fatianov to the book "Artists of Irkutsk", issued in the Eastern-Siberian publishing company in 1994. 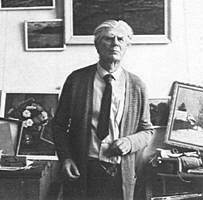 Aleksey Dementievich Fatianov – a known Irkutsk artist, honorable Irkutsk citizen, one of the most devoted persons of art dedicated his life to forming the collections of the Irkutsk art museum.